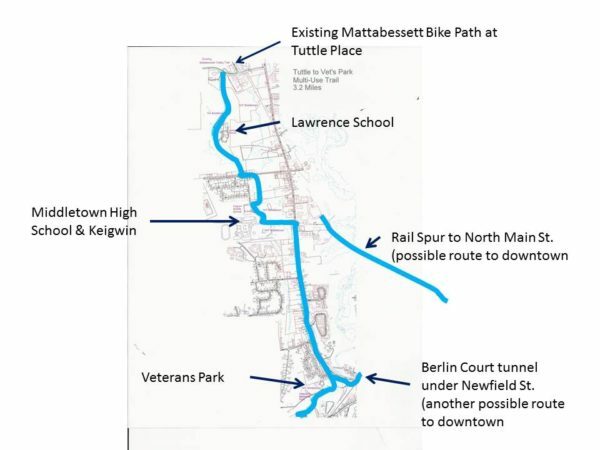 The Newfield Corridor Trail will allow hundreds of students in high density residential neighborhoods to bicycle or walk safely to 4 schools: Lawrence, Keigwin, Middletown High School, and Spencer. It will also be a huge step in creating bicycle access from Cromwell and the Westlake area of Middletown to downtown Middletown. Finally, this 3-mile section, added to 4.5 miles of the existing Mattabessett and Westlake bike paths, will complete nearly 8 miles of the proposed 18 mile Air Line Trail – Farmington Canal Connector Route, a regional project involving Portland, Meriden, and Cheshire that the Jonah Center has been spearheading. As shown in the map above, the trail’s envisioned route lies on the west side of Newfield Street between Veterans Park and LaRosa Lane, where turns toward Middletown High School. From there it follows a sewer right-of-way to Mile Lane, then beside Kaplan Drive to Lawrence School. From the school, the trail will likely continue north across city-owned open space to Tuttle Road and the existing Mattabessett Bike Path. A more detailed map of the Newfield Corridor Trail may be found here.. In 2015, the Public Works Department included $4 million in the Parks Bond for the purpose of designing and constructing bike paths, with the Newfield Corridor Trail specifically in mind. After the referendum passed, other projects on the Parks Bond list received higher priority, but the Jonah Center and Complete Streets Committee continued pushing for the Newfield Corridor Trail to be allotted funding for route definition, survey, and design work. This past fall, 2018, Public Works Director Bill Russo announced that the department will move forward. Approximately $300,000 will be needed for pre-construction work over a period of several years. The start of the project is a very exciting milestone in the development of a city-wide bike path network. Emails and phone calls from citizen advocates in the Jonah Center network have been helpful in getting the project launched. The next step will be a presentation by the Department of Public Works on Wed. February 13, at 6:30 p.m. in the Community Room in the Police Station at 222 Main Street. Watch this post for updated location. The Jonah Center, the Complete Streets Committee, and all interested residents will have an opportunity to offer support or ask questions pertaining to the presentation.